Terry Keagan started a roofing business over 20 years ago. Over time, that roofing business grew into Baron Roofing & Siding. Over the years, Baron Roofing & Siding has grown into one of the largest roof replacement companies in Niagara. 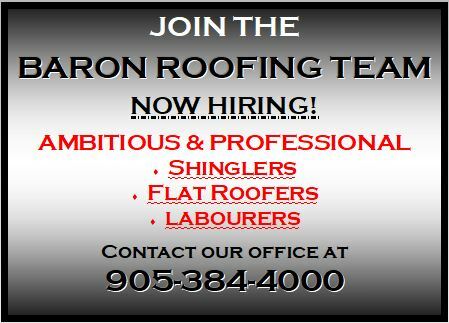 Located at 2448 Turner Road in Fonthill, Ontario, we provide the Niagara Region with premium roofing services. As a family-owned business, we blend personal service with high standards. Our team aims to consistently give superior advice, better materials, trustworthy installation, and competitive pricing to all of our customers. We also back our work with a 10-year workmanship warranty. As we’ve grown, we’ve learned that there’s more to success than product quality. Most of our excellent reputation comes from our customers’ feedback. Since we work in an industry based mostly on referrals, we value client satisfaction above all else. Our crews work hard to deliver exactly what the client wants, no matter how big or small the job is. Instead of working with sub-contractors, Baron hires full-time employees. This commitment is important to us, because it ensures quality. By keeping a staff of full-time roofing contractors, we can protect our customers from negative third-party experiences. Over the years, we have grown from a staff of seven workers to 50 employees. As time passes, they gain a built-up loyalty to the company. That loyalty often leads to a first-class work ethic and commitment to the customer. As the industry changes, we learn about the new trends. When something new hits the market, our crews upgrade their knowledge and expertise. Each one has their technical certification, and participates in ongoing in-house and manufacturer training. Over time, we’ve earned certification from major manufacturers in North America. Only a small portion of contractors receive this certification (~2%). In order to get it, we have to have the right insurance in place, as well as the infrastructure to offer customers proper warranty protection. So, whether it’s your home, cottage, community centre, business, or church, we can handle all your roofing needs. Our team will make sure that you never pay for services you don’t need. And, better yet, we’ll make sure you benefit from proper repair and replacement services. Since we work on referrals, we rely on your satisfaction to keep us going strong. You can spend a large amount of money on renovations. But, without the right roof to protect your home or business, you risk losing money in the long run. That’s why a quality roof is so important. Not only does it add value to your home, but it also protects your other investments. If you need roofing services, contact us. We’ll start out with an estimate. From there, we can find the best solutions for you. Visit our Contact page to tell us what you need. If you’re more comfortable speaking over the phone, feel free to call our office (905-384-4000). Either way, we’ll book an appointment for a free estimate with you.